A short beautiful video about a Peranakan wedding. I just love the beautiful Chinese wedding costumes worn by the newlyweds in a peranakan wedding. The bright red embroidery, crockery and decorations are so joyous and a feast to the eye. This is THE weekend of the Royal Wedding, the whole country is in a joyous mood, and I want to write about weddings as they are celebrated amongst the colourful and unique ‘peranakan‘ community in Malaysia and Singapore. The peranakans descend from Chinese workers and peddlers who came to Malaysia and Singapore from China’s Fujian (福建) or Guangdong Chaoshan (广东潮汕) regions in the South during or before the Ming dynasty and married local Malay ladies. Male offspring were called ‘Babas‘ and females ‘Nonyas‘. Together they have formed a very special culture which merges the influences of Malay food, drink, clothing and language with Chinese beliefs and rituals and pious filial devotion. A peranakan wedding ceremony lasts over 12 days, and much longer if you take into consideration the whole preparatory ‘countdown’ period. All the relations (mostly the womenfolk) arrive to help make rice and glutinous rice flours from scratch (4 days before the wedding), peel and chop onions (3 days beforehand), fry sambal (2 days beforehand)… and the list goes on and on. On the wedding night, a feast called ‘cuntok‘ is placed in the bridal chambers. This comprises 6 meat dishes – involving pig trotters, roast pork, pig’s kidney, heart, liver and tripe – a vegetable dish with 10 must-have ingredients (beancurd sticks, vermicelli, wood-ear black fungus, enokitake mushroom, cabbage, shiitake mushrooms, turnips, pork, prawns and dried fish stomach), a bird’s nest dish, a prawn dish, a siew mai dish (steamed pork dumplings), a Chinese sausage dish and a soup containing crab and pork balls called ‘bak wan kepiting‘. That’s 12 dishes in all! shells and heads till fragrant (about 5 minutes). – Remove from pan & blend in mixer. chopped spring onions, salt and pepper. the garlic until brown and fragrant. boil and check for seasoning. – Shape meat into balls & simmer in the stock. fried onions on the wedding night. The bridesmaids help serve the food. The bride and groom must bow to each other as it is the first time they have ever met and to signify that they will respect each other henceforth and till the end of time. The third day is also important as it is the day where the bridegroom goes to the bride’s house to greet parents and elders, performing a standing bow and a kneeling bow 3 times. This is distinct from the wedding tea ceremony (see below). On the fifth day, the bridegroom gathers his male friends, basically his best man and the ‘ushers’ and goes with them to meet with the bride and bridesmaids. They drink wine and nibble on small food items and joke about trying to make the bride smile or laugh. It is imperative the bride doesn’t break into laughter or even smile, as that would unladylike, i.e. She shouldn’t appear too eager to get married (‘a bread-and-butter miss’). 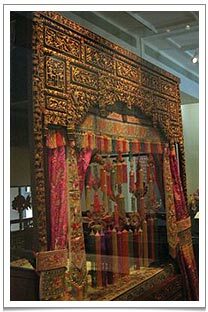 Bridal chamber display at the Peranakan Museum in Singapore (39 Armenian Street). Once the ‘attestation’ is done, the groom’s family cook coconut rice and various spicy dishes to be delivered to the bride’s family. Upon seeing this coconut rice and only then is the bride allowed to offer her mother-in-law a cup of tea in the peranakan tea ceremony, and only is she accepted into the groom’s family. Thus it’s an extremely important cup of tea! And it can’t be taken for granted! I dread to think how many poor girls through no fault of their own were effectively rejected by their new husband’s family left in a sort of miserable limbo! The wedding tea ceremony proceedings are inherited from the Chinese wedding tea ceremony. The young couple stand, bow and kneel in front of each set of parents and elders 3 times and then offer them a cup of sweet ‘tea’ while the matchmaker would rattle off a series of good wishes and greetings. The sweet ‘tea’ is really a fruity tisane comprising Chinese red dates, candied winter melon, dried longan fruit and “bingtang” (冰糖 crystallised rock sugar) lightly boiled and allowed to infuse into a beautiful and auspiciously red-hued liquor. Do pop over to the Chaya Teahouse this weekend as we will be serving this Peranakan wedding tea. I just love the beautiful Chinese wedding costumes worn by the newlyweds in a peranakan wedding. The bright red embroidery, crockery and decorations are so joyous and a feast to the eye. I have thoroughly enjoyed myself writing and reminiscing about wedding tea ceremonies from my part of the world, as my way of joining in on the celebration of the Royal wedding. PS: We are serving both the Chinese and Peranakan wedding tea this weekend at chaya teahouse together with the Hainanese Wedding pastry “Yi Buah”. Do pop by to the teahouse and celebrate the Royal Wedding with us!